Pandas are one of the world’s most beloved animals. It is almost shocking that they are not featured in more games than they are. Land-a Panda, from Big Pixel Studios is doing its part to change all that. The game tasks you with hurling a panda across a dangerous expanse so that he can meet his lover on a floating platform. Do not ask how two pandas managed to get themselves into such a situation. You will find no answers within the game. But since pandas are an endangered species, it has to be a good idea to launch them out of cannons and into an uncertain abyss. 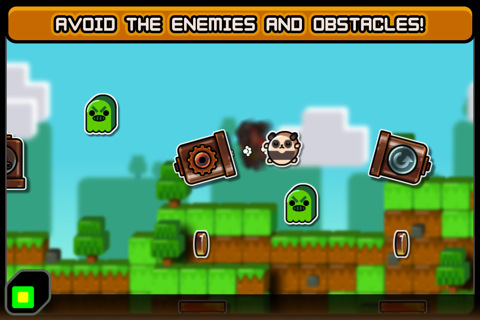 The panda is launched from cannon to cannon, until he reaches his partner at the end of the level. He can collect coins along the way for a higher score, because I guess female pandas are pretty fickle about things like money these days. 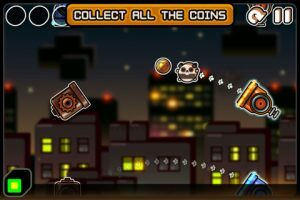 Things start excruciatingly simple at first, but things get challenging quickly enough as the game adds more and more obstacles like deadly spikes and some pissed off canaries. Eventually you will have to start employing something close to real strategy in order to complete levels. You’ll have to study the maps and think ahead, especially when the game introduces teleports and stone blocks that must be smashed through. Land-a Panda features four themed worlds: the spring/nature themed Panda Land, a night time cityscape called Rooftops, Snow World which is exactly what it sounds like, and Panda Zoo. Each of the worlds contains twenty different levels and Big Pixel plans to add more worlds in the future. Land-a Panda is a great game for the iPhone. It looks and sounds about as cute as you would expect a game based on cartoon pandas to be, and it is easy to pick up and play, but still offers a decent challenge without being frustrating. And it is only a buck, which is cheaper than a trip to the zoo to see a real panda. And they don’t let you blast pandas out of cannons at the zoo either.